In August, 2004, when I was 11 weeks pregnant, my OB/GYN found abnormalities in my first official pregnancy Pap smear. Funny that my annual exam on July 2nd, just 5 weeks prior, when we didn’t know I was pregnant, came out normal. I was scared to death. 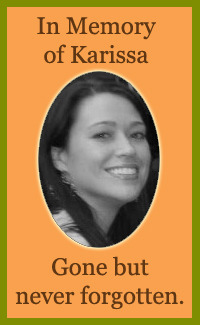 One of my best friends, Angela, had just been diagnosed with Cervical Cancer the previous April. She went from a diagnosis of “cervical lesions” to positive for the bad strains of HPV , to “you have an aggressive form of Cervical Cancer” to a radical hysterectomy in just 6 short weeks. Because of Ang, I had done some research about HPV & how it causes Cervical Cancer. When I got the call from my OB/GYN’s office, I knew it was bad. I, too, tested positive for the Cancer causing strains of HPV. I was devastated. My choices were to abort my pregnancy & get treated for the “lesions” right then, or go through with my pregnancy, be very closely monitored, pray that it would have no effect on my unborn baby & start treatment as soon after giving birth as was healthy for me. I, of course, chose the latter. Until I gave birth & my OB could do a cervical biopsy, we did not know for certain that I had Cervical Cancer, but I did. Somehow I just knew it was Cancer. I started researching how HPV/Cervical Cancer affects an unborn child. It was not good. If I did not have Cancer & it was just the lesions, I gave birth vaginally, & the lesions were in an “active” period, then my baby could get infected with it. The lesions would go into her throat and cause breathing & swallowing problems which would require several laser surgeries to correct. My doctor told me this was a very rare occurrence, but I really wasn’t buying it. If it was, in fact, Cancer & progressing, then my cervix could become so weakened that I could have a late term miscarriage. In addition to all the normal pregnancy worries & those triggered by reading “What To Expect When You’re Expecting”, I had this to deal with. I was not happy. I was petrified. Not to mention that I have Polycystic Ovarian Syndrome & was told I would need fertility drugs to even try to conceive a baby, which, of course, I was afraid of using. The fact that I got pregnant without even trying (I was on the Pill) made this my miracle baby. I had long ago resolved myself to the very distinct possibility of never having a child of my own. So, with all this on my plate already, I was not even thinking that I had Cancer. I was far too worried about having a healthy pregnancy & baby to even consider that possibility. And yet it was my reality. About 5 weeks after getting the news of the HPV and lesions, I had two major seizures in as many days. Whether they were caused by stress or a resurgence of the seizures I had following a car accident when I was 17, we will never know. With the first one, all I remember is going to the bathroom to throw up (the second one happened the next day while I was in bed). My husband found me on the bathroom floor, unresponsive. I was taken to the ER where they basically did nothing for me. I had to beg them to check my baby’s heartbeat. All I cared about is if my unborn child was alright. Nothing else mattered. I was discharged after hearing my baby’s heartbeat and getting an appointment with a neurologist for an EEG. Unfortunately, the hospital could not do a CAT Scan on me because of the pregnancy. I was also told that when you have a seizure, you generally stop breathing for a period of time and because I was pregnant, that meant that my baby was also deprived of oxygen. We wouldn’t know for sure if this affected my baby until I gave birth. Great. More stuff to worry about. Just what I needed. Neither the first quack neurologist, nor the second one I demanded to see could determine what caused my seizures. Wonderful. From this point on, my pregnancy was rather uneventful. I joyfully watched my belly grow & grow. I was almost giddy the first time I saw my belly undulate with the, as yet to be felt, movements of my baby. I was ecstatic the first time I felt her kick. It was awesome! I played classical music for her on a microphone system made just for pregnancy. I talked to her. I told her stories. I prayed for her & my family out loud so she could hear me. But no matter how happy I looked & sounded on the outside, always in the back of my mind was “It’s Cancer. Is it going to hurt the baby? Will I live long enough to raise her?” It was torture! Also, because of the seizures, I did have to endure non-stress tests three times a week starting Christmas Eve, 2004, until just before I delivered her March 10, 2005. You know how dreams are way more vivid when you’re pregnant? Well, about a week or two before she was born, I had a dream that I had given birth and my Husband gave the baby to another woman who promptly left the hospital with her. In the “vision”, I was literally stuck in the bed & no matter how hard I tried, I couldn’t get out to get my baby back. It really rattled me. I did not know then just how prophetic that dream truly was. In any case, my baby survived & on May 12, 2005, I had a Cervical biopsy & Cryo-surgery for my “lesions”. Two weeks later, it was confirmed that I had Cervical Cancer, but my doctor thought he had gotten it all. I wasn’t so sure. I had a newborn, I felt like the Human Milk Cow, I had Post Partum Anxiety Disorder & I had Cancer. Oh, Joy! I was tired, depressed, moody & petrified. This was not what my life was supposed to be, not by a long shot! I continued to come in every two months for Pap smears. In September, the abnormalities & lesions reappeared. I flipped out & had my first, and I hope only, panic attack. Luckily, I had the presence of mind to call my best friend, Carol, who talked me through it. It was a rough time for me. On November 4, 2005, I had my second surgery, the LEEP & a D & C. My doctor was absolutely certain this time that he had gotten it all. I was hopeful. I prayed. Hard. He was right, he had gotten it all! I somehow didn’t need Chemo or Radiation therapy (I am convinced I have a special Angel watching over me). There is, however, a large chunk of my cervix missing & I will probably never carry another baby to term, but I am alive. I am also happy to report that I have been Cancer free for over 3 years now. Praise Jesus! What has always bugged me, and what no doctor has been able to tell me, is where does HPV come from? The CDC/AIDS Researchers have been able to determine that HIV started with an African Rhesus Monkey & tracked the AIDS spread down to “Patient Zero”, a male, Bi-sexual International flight attendant, so why haven’t they done the same with HPV? It bothers me. I also don’t understand how I had a normal Pap Smear on July 2nd, when I was, in fact, pregnant, but we didn’t know it yet, then in mid-August my Pap was abnormal & I had HPV! I will forever be confused about this one. What I truly want you all to know is this: Breast Cancer gets all the press. There are pink ribbon campaigns, pink kitchen utensils, even pink ribbon cans of Campbell’s soup. There is nothing done for Cervical Cancer/HPV Disease. I’ll bet hardly any of you knew that January is it’s National Awareness Month. They can’t even decide on a color! One site says it’s teal, another lavender. Geez! But Cervical Cancer & HPV are more insidious than Breast Cancer. You could be infected with it for years & not even know it. And you can always pass it on to your partner. Some women who get infected have no adverse effects at all. The virus simply lies dormant in their cervix for years until their body gets rid of it. Others, like me and my friend, get Cervical Cancer. That is how insidious this disease is. The other thing that really chaps my hide is that HPV does not affect the infected man’s fertility and in only extremely rare cases causes Cancer (mostly homosexual men). But male carriers will infect their sexual partners regardless of if they use a condom or not. HPV is not just internal. It can live on the skin of the genital area where the condom does not cover. Please make yourselves aware of this disease. I will leave you with this, dear readers, whatever your religious beliefs, get your daughters vaccinated with Gardasil. It is not a magic bullet. It will not prevent STD’s. But it can prevent your daughter from going through what I went through. It is the first ever inoculation against the virus that causes Cervical Cancer. This is HUGE. Truly. And even if a girl saves herself for marriage, there is no guarantee that her husband did the same. And since men generally have no symptoms & there is no reliable test to determine if he has been infected, isn’t it better to be safe than sorry? As soon as my daughter is old enough, she is getting the shot. I will do whatever I have to do to protect her. Please do the same for your own daughters. Thanks for sharing your story. I am happy you and your baby are going good. I am so sorry you have had to go through so much. Educating the rest of us is a great way to get the word out. WOw, this made me realize I need to go in for my annual exam now. I usually wait until I run out of BC, but I need to make sure I’m healthy. Thank you so much for sharing this story. I’m so glad they developed that vaccine. I think every young girl should be required to get it. Thank you for sharing your story! I must admit, that I was not as aware as I should have been until just now! You truly are a strong woman. There is no other explanation (besides Angels), considering the things you have endured and survived! God Bless!! Wow thanks for sharing your story, it was deeply moving and man you are so brave! Great post. I am pro vaccine for this disease. This is a no brainer. Your story is great and I hope it convinces other women to vaccinate their daughters, I know I will. AND Congratulations on winning your fight. Wow, what an earth shattering post. I’m so sorry that you had to go through this, but it sounds like this experience has made you a stronger and more knowledgeable women. Thanks so much for sharing your experience. Hopefully your words will help other women out there who are going through the same thing. Sounds like you did have a miracle baby. What a happy occasion for you. You are truly blessed. Thanks for sharing your story. Your story is so powerful. Thank you for sharing it with us. You convinced me to do this for my daughter when she’s old enough. What an amazing woman of strength you are! Your daughter is so blessed to have a mom like you. Hello, I´m follow you because I really like your blog. What a tremendous story of courage and love! God is so amazing with what we allow Him to do in our lives! Absolutely beautiful blog! How do you make a blog like this? Wow, thanks for sharing your story. You have truly been through. Praise the Lord for your healing, God is good. I look forward to reading your blog here on Blog catalog! Crap! Now you have me all worried and thinking I need to do my pap! Crap! I would like to go back to being ignorant, bc I didn't know about all the stuff you mentioned, and I am now wondering about the slutty females my DH may have been with before we were together. Seriously, the whole gardasil vaccine is one that scares me, bc like other vaccines, it gets a bad rep, but now you have me reconsidering, not for me, but for my sisters bc they are young (9,13,&17). I'm really sorry that these are the memories you have from your first year as being a Mom. You really did go through alot! I'm so glad you are healthy now! I'm sending you hugs! Omg I am sitting here in tears! I just want to tell you thank you for your post. I don't speak about what i am going thru but I just want to let me know your msg has just gave me hope and encouragement *HUGS* It's crazy how someone's own story can change your outlook on things. Thanks AGAIN! YOU ROCK! GOD BLESS! I did not have cancer, I had pre-cancerous cells. My OB-GYN was great, but I knew after he tried to remove the cells that it would not be over. I ended up having a partial hysterectomy at 30 years old. Not too big of a deal since I have 3 kids and my tubes were tied. Funny, though, I made the appointment with my OB-GYN because I knew something was wrong, not for anything else. Maybe one day they will figure out where HPV comes from and what we can do to help prevent its spread. your story is so hauntingly similar to my own. so much so that I'm having a hard time breathing. It's that waiting between the time where they think they got it all and then to find out they didn't which is the hardest for me. Thank you for sharing your story. My daughter is in Stage 111B of Cervical Cancer and they don't have a lot of hope. Prayers for all you those with Cervical Cancer. What a wonderful story you have shared. I have to go now to grab a tissue to wipe my eyes…. .-= Stefani´s last blog ..ItzBeen Review And Giveaway =-. « I Just Had Another One Of My Brilliant (HA HA) Ideas!